NowInfinity have always been on a mission to uncover pain points in financial businesses and solve them through technology adoption. We are a feedback driven business and continue to develop based on listening and observing market needs to deliver unprecedented products. Collaboration is a core part of NowInfinity. We collaborate with like-minded businesses to enhance the end user experience. We partnered with Xero Practice Manager to provide users the ability to work across both Xero and NowInfinity seamlessly. Jobs in XPM can be completed in the NowInfinity platform, and data shared across both, without the end user having to repeat data entry. This also significantly reduced human error. 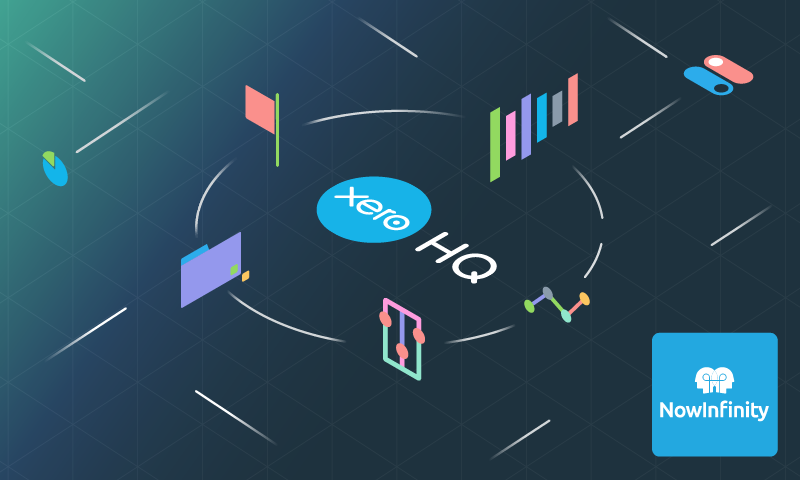 Our new Xero HQ integration is the next step in our development. NowInfinity integrates effortlessly with Xero HQ to ensure you are always one step ahead of compliance by providing you with optimised workflows. It keeps you working across your platforms with ease. In particular there are three key areas of the integration which we believe are complete game-changers. The first is the ability for the NowInfinity platform to identify any discrepancies between your platforms (including regulatory platforms) and provide the user with workflows to amend these discrepancies. For example, if an address discrepancy has been identified, you will be given the option to complete a change of address form in NowInfinity with most information pre-populated for you. Secondly, the NowInfinity compliance platform will ensure that all important client entity notifications are sent through to your activity feed so that you never miss a beat – whether they’re document lodgement deadlines, signing notifications or annual statement payment deadlines. Stay one step ahead of compliance and never incur a late fee again. Thirdly, with the NowInfinity and Xero HQ integration, you can have your client’s entities and a Xero Organisation set up in under five minutes using our legally backed document templates. How? Well, if you are setting up a company in NowInfinity, the document template is pre-populated with all available client details pulled from Xero. All you have to do is fill in the gaps. It’s as simple as clicking ‘complete’, and it will be sent off to ASIC for approval in under a minute. All of your supporting documents such as minute and constitutions will be ready as well as the ability to apply for ABN and TFN, copy files to cloud storage, sign them electronically – and, of course, push them into Xero HQ. This newly registered company will now appear in Xero HQ. From here a Xero Organisation can be set up straight away! NowInfinity’s Xero HQ integration is all about helping the accountant optimise their workflows and providing them with the tools to stay ahead of compliance. Impress your clients by speeding up your workflows and increasing your efficiency. To find out more about how NowInfinity integrates with Xero HQ, visit them on the Xero App Marketplace. If you are ready to change the way you handle compliance and work seamlessly across your platforms, sign up to NowInfinity today by heading to www.nowinfinity.com. Also, if you’d like to arrange a personalised demo, feel free to email info@nowinfinity.com.au. If you’re already a NowInfinity user and ready to get started with your Xero HQ integration, contact us and one of our team members can step you through the process. Got any comments? We’d love to hear from you – just leave any feedback below! The post NowInfinity + Xero HQ: Taking the pain out of managing client entities appeared first on Xero Blog.